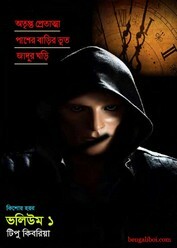 There are three Ghost/Horror stories in this book, these are- Atripta Pretatma, Pasher Barir Bhoot, Jadur Ghari. 'Atripta Pretatma'- Tiana school's, there is annual drama is going to be staged. The name of the play is 'Pretatma'. But from the beginning of the rehearsal, there was a mysterious incidents happened after the other. 'Pasher Barir Bhoot'- Sourav's family have rented the house next to Anchal's family. When did they come to the new home? Anchal does not know this. Do not know her parents also, How is it possible? Is Sourav really blood-flesh human? 'Jadur Ghari'- If the days are going to backward, if you become shorter slowly, how would it be? Raja's age has decreased, and he is getting smaller. Strange, is not it? Read this teenage horror story book- 'Kishor Horror stories' you can collect it as a pdf file from link below.